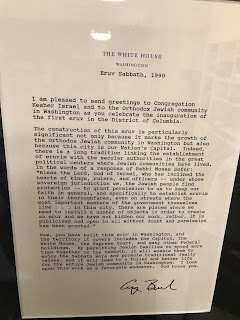 This Shabbat we read in the Torah both parashat Vayakhel and the special Torah portion for parashat Shekalim, that describes the half shekel donation given in Temple times to the Temple treasury to support the Temple’s budget, but also to serve as a way of conducting a census of the nation. Parashat Vayakhel’s opening verses (Exodus 35) juxtapose two major themes: the mandate to construct a mishkan -- a portable tabernacle, with the call to observe the Sabbath. Prior to mentioning both of these lofty directives, Moses gathers all of the Children of Israel. A famed Chassidic Rebbe, Rabbi Abraham Bornstein, the first Rebbe of Sochatchov (1838-1910, Poland) found significance in the order of the three items that are mentioned in the opening verses of Vayakhel: 1) first a call to unify and to gather the nation, 2) then an admonition to observe the Sabbath, and 3) only then are the people encouraged to erect the Tabernacle. Rabbi Bornstein points out that prior to consecrating the Tabernacle, individual Israelites would sacrifice to God on bamot, elevated stages that were found throughout the Israelite camp. With the consecration of the Tabernacle, use of the bamot became prohibited. As the sacrificial order became unified, the Jewish nation was united with the Tabernacle serving as the nation’s headquarters. For this reason, advances the Sochatchover Rebbe, the command to unify and gather came first, followed by Shabbat, the special sacred day that holds the secret of Jewish unity. Only after those first two levels of unity are established, does the third take place, centralizing Jewish worship by consecrating the Tabernacle. Jewish rituals work, and given their uniformity throughout the Jewish world, unite Jews around the globe. Every "Trekkie" knows that Spock’s Vulcan salutation is accompanied by a strange hand gesture. What many don’t realize is that Leonard Nimoy borrowed this symbol from his traditional Jewish upbringing. It’s actually a one-handed version of two-handed priestly blessing gesture. May God shine His face toward you and show you favor.May God be favorably disposed to you and grant you peace. Birkat Kohanim, the priestly blessing, is also known as duchenen (Yiddish, referring to the duchan the special platform in the Temple from which the blessing was recited). Birkat Kohanim is also known as Nesi'aht Ka’payim (lifting of the palms/hands). While Birkat Kohanim was bestowed daily in the Temple, current customs vary as to how often the blessing is bestowed by the kohanim(daily, every Shabbat, holidays only). To bestow Birkat Kohanim, the kohanim (priests) stand facing the congregation, their tallitot (prayer shawls) draped over their head and arms. They stretch out their arms and, beneath the tallit, arrange their hands with the ten fingers separated to create 5 spaces (pinky-ring-space-middle-index-space-thumb-space-thumb-space-index-middle-space-ring-pinky). The position of the hands reflects the latticework mentioned in Song of Songs (2:9): "My Beloved...looks through the windows peering through the lattice." The prayer is recited responsively, one word at a time, first by the cantor and then repeated by the kohanim. While Birkat Kohanim is being recited, congregants are not to look directly at the kohanim and many cover their faces with their prayer books or prayer shawls, following the Talmudic dictum (Chagiga 16b) "One’s eyes will grow weak if one looks at the hands of the priests [during the blessing]." Leonard Nimoy died on February 27, 2015. This Treat was originally posted on June 2, 2011. Express Jewish pride when popular cultural references find their source in Jewish tradition and wisdom. Ariel “Arik” Sharon served with unusual distinction and considerable controversy both in a military uniform and as a politician. Sharon’s life of accomplishment was punctuated by his ruthless grit and legendary Israeli confidence. Ariel Scheinerman was born on February 26, 1928 to Shmuel and Vera Scheinerman in Moshav Kfar Malal, near Raanana, Palestine (now Israel). David Ben Gurion requested that Scheinerman Hebraicize his last name to Sharon. As a teen, Ariel joined the Haganah, which eventually became the Israel Defense Force (IDF). Ariel Sharon fought for Israel’s independence (where Sharon was wounded in the groin, stomach and foot). He created Israel’s first commando unit that eventually became the IDF’s Paratroopers Brigade, and was a hero of the 1967 Six Day War, leading an armored division in the Sinai. Sharon came out of retirement when the Yom Kippur War broke out. Arriving at the front in his civilian car, Sharon’s forces crossed the Suez Canal, encircled the Egyptian Third Army, and effectively, ended the war. Sharon helped found the right-leaning Likud (unity) political party in July, 1973. As a supporter of settlements, Sharon became the patron saint of the “Gush Emunim” movement, who strove to build Jewish settlements in the internationally-disputed areas that Israel gained during the Six Day War. Sharon emerged from the 1977 Knesset elections as Minister of Agriculture, and after the 1981 election, Minister of Defense. In this capacity, in 1982, he helped launch “Operation Peace for Galilee” to expel the Palestinian Liberation Organization (PLO) from their base in Lebanon. While the PLO was forced to relocate, the war is remembered for a massacre of Lebanese Moslems by Lebanese Christian troops. A blue ribbon Israeli commission concluded that Sharon, who had overall responsibility as Defense Minister, didn’t stop the carnage, and found him indirectly culpable. Sharon resigned as Defense Minister but remained in Prime Minister Begin’s cabinet. Sharon eventually became the Likud’s leader and was elected Prime Minister on February 6, 2001. Despite Sharon’s history as a hard-liner, in May, 2003, Sharon endorsed U.S. President George W. Bush’s “Roadmap for Peace.” To allow for Palestinian autonomy in Gaza, Sharon supported removing all Israeli citizens and forces from the Gaza Strip, captured in the Six Day War. In August, 2005, 9,480 Israelis were expelled from 21 settlements on the Gaza Strip. Although 80% of Israelis supported the Gaza disengagement, the move was extremely unpopular within the Likud party. On November 21, 2005 Sharon resigned as head of Likud and created the Kadima party. On January 4, 2006 Sharon suffered a massive stroke, which left him in a coma. Ehud Olmert assumed the prime ministership upon Sharon’s debilitation and won the Knesset elections in March, 2006. Sharon succumbed on January 11, 2014. Learn about the lives, sacrifice and heroism of Israel’s founders and pioneers. “The Circle of Life,” is both an apt description of the ups and downs of the life cycle, and also an award-winning song written by the legendary Sir Elton John for the 1994 movie hit “Lion King.” The “Circle of Life,” could also be the appropriate title of a much earlier fascinating event described in the Talmud. A rabbi named Choni, who lived in the first century BCE, committed an act of great audacity toward God. The Talmud (Ta’anit 19a) states that most of the Hebrew month of Adar had passed and rain had still eluded the land of Israel. The Jewish leadership asked Choni, known for his extreme piety, to pray for rain. He did so, but to no avail. In an act of desperation, he drew a circle on the ground, and stood inside it, refusing to leave the circle until God sent rain. This act forever labeled him as Choni Hama’gel, Choni the circle drawer. A light rain began, but those assembled complained that unless a strong rain would come, they would all starve. Choni did not leave his circle and prayed for a more robust rain. No sooner had Choni prayed, a torrential rain began, threatening to flood the world. Choni then directed his prayer to God: “It is not for this that I have prayed, but for rain of good will blessing, and bounty.” A hefty rain began. Choni then prayed that the rains cease, and they did. According to Megillat Ta’anit, which features an ancient listing of important dates on the Jewish calendar, this Talmudic episode with Choni occurred on the 20th of Adar. This story teaches us about the power that God gives to the righteous, and God’s willingness to be dictated to by those whose motives are purely to protect God’s chosen people. Although most of us acquire our food at a grocery store or supermarket, let us not forget that the wrong amount of rain can destroy food for millions of people. When we pray for rain, we pray for food. The Hebrew word for miracle is “nes.” Yet the very same word also means “pole” in Hebrew. What can we learn about the Jewish concept of miracles from a pole? The first appearance of the word “nes” in the Torah appears not in the context of miracle, but regarding its cognate, pole. God had just said to Moses, “Make a venomous serpent, and set it upon a pole; and it shall come to pass, that everyone who is bitten, when he looks upon it, shall live.” After the Children of Israel fought a successful battle against the Canaanites, the nation became embittered, complaining that there was no bread or water, and how they were becoming tired of the manna which sustained them. God sent venomous snakes to the Israelite camp, who bit many people who died from the injuries. The nation approached Moses, admitted that they had sinned and asked Moses to pray to God to remove the snakes. It is here where God instructed Moses to make this pole. Jewish wisdom is telling us that a miracle is like a pole, on which is flown a banner or flag. We rally around a banner, and the banner is often a means to inject pride and faith. So too with miracles. Supernatural Divine events are not themselves the source for inspired faith; they are occurrences that we can rally around, helping us grow in our trust in the Almighty. Faith, by its very nature, cannot be proven. But events we encounter and witness can help bolster our faith. Seek out those inspired events. The episode of the Golden Calf represents one of the most tragic episodes in the history of the Children of Israel. A mere 40-days prior, the Jews stood at the very same Mount Sinai, after the miraculous redemption from Egypt, and heard God, their Savior, declare an absolute severe prohibition against any forms of idolatry. How could the people who heard and experienced Revelation create, or minimally, rally around the creation of an alternative leader? Furthermore, how could they ever recover from such a misstep? The text of the story in parashat Ki Tisa states, (Exodus 32:19), “And it came to pass, as soon as he [Moses] came near to the camp, that he saw the calf, and the dancing; and Moses’ anger burned hot, and he threw the tablets from his hands, and broke them beneath the mount.” How could Moses break the most precious physical objects ever created? After all, God personally fashioned the tablets, as the Torah describes (Exodus 32:16). The sages offer many answers. Some suggest when the Jews worshipped the golden calf, the miraculous tablets lost their power. As such, Moses discarded them as useless, or, according to another version, was unable to lift them anymore, as the supernatural component that allowed him to hold them disappeared with the sin. Still others argue that Moses cast them down due to anger and disappointment over the Jews’ errant behavior. One opinion in the Midrash proposes that Moses shattered the tablets as a betrothed man would sever the marriage contract in light of infidelity of their betrothed, as the consequences for adultery are much more severe. Moses too shattered the tablets, which symbolized the binding covenant with God. We can all learn an incredible lesson of leadership from Moses. He sought not glory for himself; he saw his job primarily as representing and defending his people. Although there are many factors leaders must consider when making decisions, never lose track that a leader first and foremost must represent and protect his or her flock. On February 20, 1816, Rossini’s classic opera, The Barber of Seville, premiered at the Teatro Argentina in Rome. In tribute, Jewish Treats will address the Torah’s instructions for barbers. The Torah (Leviticus 19:27) declares, “You shall not round the corners of your heads, nor shall you mar the corners of your beard.” In order to understand this Biblical verse, we must identify what are the “corners of your head,” what is considered “marring,” and upon whom is this proscription? The rabbis (Makkot 20a), have declared that this prohibition, which only applies to men, refers to five parts of the face. There is some dispute as to where these five spots are, but many identify them as the two bones where the skull meets the cheek, the two bones on the bottom of the face near where glands would be checked, and the chin. Since there are multiple opinions, “shaving” is not recommended on any part of the face from the temples down to the cheeks on the front and sides of one’s face. Shaving, however, is defined narrowly, as using a razor. Using scissors to cut the hairs, or depilatory creams or powder would be permitted. As such, a Jew using an electric shaver to shave his face must ascertain that the blades of the electric shaver function as scissors (i.e. two blades cutting the hair at a distance from the root) and not as a razor. There are opinions that Jewish men should refrain from shaving their face altogether, and allow side-curls to remain, as seen primarily among Chassidic men. A male Jewish barber must not violate the Torah prohibition of shaving another Jewish man’s face. A Jew who is shaven with a straight-edge razor by a non-Jewish barber, violates the prohibition if he is an active participant. May a Jewish woman shave a Jewish man’s face with a razor? Maimonides rules that a Jewish woman who shaves a Jewish man’s face is exempt from the prohibition. However, the Code of Jewish Law, Shulchan Aruch, records that “some say” that a woman does violate the prohibition if she shaves another Jewish man’s face. Some argue that while a woman may technically be exempt from the prohibition of shaving, she may still be in violation of the dictum of “not placing a stumbling block in front of the blind” by allowing the Jewish man to have his face shaved. NOTE: As with all Treats dealing with issues of halacha (points of Jewish law), one should consult one's local rabbi for practical application. Explain to your barber prior to your haircut how you want him or her to cut your hair, both aesthetically and religiously. The holiday of Purim marks the anniversary of God’s overturning the wicked plot of Haman (read the full story) on the 14th of Adar. According to tractate Megillah 6b, during a leap year Purim is observed in Adar II. 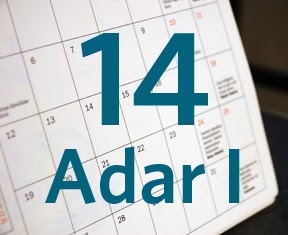 However, during Adar I, the importance of the 14th of Adar must also be acknowledged. Purim Katan, “Little Purim,” as 14 Adar I is called, is therefore observed as a minor holiday. On Purim Katan certain aspects of the prayer service are omitted, fasting is forbidden and eulogies are generally prohibited. Additionally, it is considered praiseworthy to mark the day with a small festive meal (perhaps preparing or ordering a nicer lunch). This Treat was originally posted on February 14, 2014. Begin planning costumes, menus and plans for Purim. “Is there an eruv?” is one of the first questions on the lips of observant Jews when seeking to move to a new community. 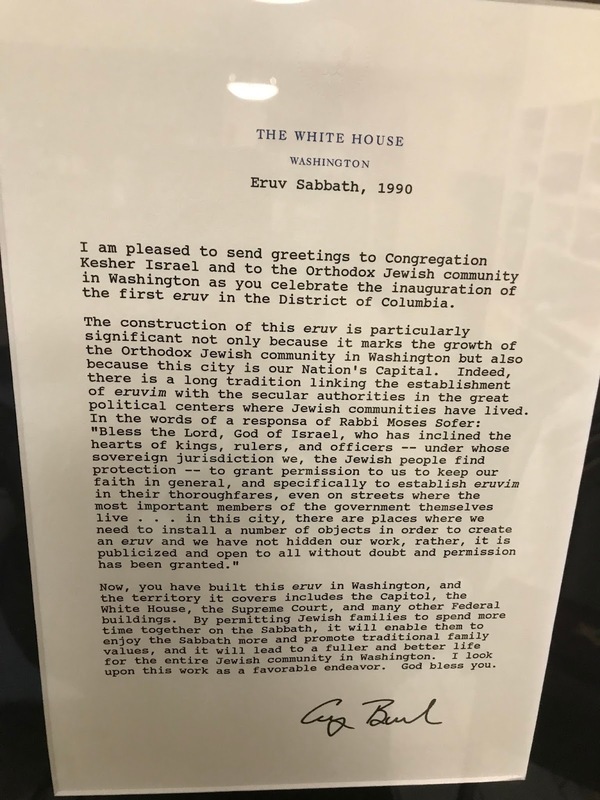 Read on to learn why, and in honor of President’s Day, discover how and why a U.S. president was involved with one community’s eruv. One of the 39 prohibited acts of Shabbat, known as melachot, is carrying, or transferring an object from one domain to another. This melacha differs from the other 38 in a few ways, one of which is that the sages promoted a loophole to allow for carrying, pushing baby carriages and transferring domains, by transforming “public” domains, where carrying is proscribed, to a large “private” domain, where these acts are permitted. This is accomplished by encircling the public domain with what Jewish law would call a wall. Jewish law offers four types of “walls” or legal barriers: natural walls such as river banks, mountains, actual walls, and what is called tzurat hapetach, the outline of a doorway. The latter allows for a wall to be comprised of a series of “doorways,” so long as each “door” has the minimal form of a doorway and a lintel. Often telephone poles and utility wires can be used. The word eruv comes from the Hebrew root to mix, i.e. mixing the private and public sectors. The sages mandated that all those residing in the area of an eruv must symbolically become unified. There are two ways to accomplish this. One is by collecting a food item from all Jews in the area, usually facilitated by using communal funds to purchase a box of matzah (matzah remains edible for a long time). The blessing over creating a communal eruv is typically made annually over this box of matzah. The second method of unifying all residents – Jews and non-Jews – is by renting the area from the local jurisdiction for the purpose of Shabbat carrying and transporting. Often this “rental” takes place through a mayoral proclamation for 99 years at the price of $1. On this President’s Day, appreciate the fact that Jews and Judaism are protected and promoted in our great country. The phrase “Clothes make the man” was adapted by Mark Twain from Shakespeare’s “For the apparel oft proclaims the man,” a comment made by Polonius in Hamlet. “Dress for Success” was a 1975 bestselling book by John T. Molloy, which began the discussion of “power dressing.” Does Judaism agree that the clothes indeed have such an impact? Parashat T’tzaveh’s main theme revolves around the special clothing created for the kohanim, the priestly caste descended from Aaron. The fourth verse in the parasha serves as an introduction to the importance of proper raiment: “And you shall make vestments of sanctity for Aaron your brother, for glory and splendor” (Exodus 28:2). The clothing one wears can impact a job interview, a date, or any forum where one wants to make an immediate positive impression. The Talmud speaks disparagingly about a scholar with a stain on his clothing (Shabbat 114a). But when serving as priests, humankind’s emissaries to God, does God really care about what is worn? Is God not able to see our souls? Is external garb relevant when communicating with God? Endeavor to dress up, in order to elevate religious practices such as prayer services, Torah study and other rendezvous with God. Those unhappy with the name given to them at birth are in luck, for today is “Get a Different Name Day,” annually observed on February 13th. This allows Jewish Treats the opportunity to recall the importance of one’s name and how and when it can be changed, as described in the Jewish Treat below, most recently published on November 10, 2016. If names are so important, why do some people change theirs? The most common reason that people change their names is to add blessing, most often in times of challenge. When someone faces a life-threatening illness, they may be advised to add an additional name. Traditionally, the new name reflects blessing for healing, such as the masculine Refael (God has healed) or Chaim (life) or the feminine Chaya (Giver of life). This change is usually done with the guidance of, and in consultation with, a rabbi. The act of changing names is even recorded in the Torah. God changed Abram’s name to Abraham and Sarai’s name to Sarah. It was only once their names were changed were they able to conceive the son for whom they had waited so long (Genesis 17). On this “Darwin Day,” commemorating the birth of Charles Darwin on February 12, 1809, we address the issue of Darwin’s own belief in God, given his authorship of the famed Theory of Evolution. Before embarking on life in the clergy, Darwin joined the H.M.S. Beagle on its journey around the world from December 1831 through October 1836 to survey natural phenomena around the globe. After the voyage, Darwin wrote in his autobiography that during the trip he was orthodox in his belief in the veracity of the Christian Biblical narrative, but over time he became skeptical. By early 1837, when Darwin began writing about his famous theory on the evolution of the species, he viewed his ideas as a departure from the traditional dogma with which he was raised. Paley’s theory on theodicy (why bad things happen to good people) proved unconvincing to Darwin. Darwin stopped attending church in 1849, although his wife and children did continue their affiliation. After the 1859 publication of Darwin’s magnum opus, “On the Origin of the Species,” many reviewers highlighted the compatibility of Darwin’s theory with the belief in God, while others saw it as proof that Darwin was an atheist. The truth lay somewhere in the middle. Darwin never shut the door on the existence of God describing himself as “agnostic.” He consistently refused to allow his writings and theory to serve as proof for atheism, although he did admit that he no longer believed in the Biblical account of a Divine revelation or in the Christian views of Jesus. Darwin wrote “In most extreme fluctuations I have never been an atheist in the sense of denying the existence of God. I think that generally (and more and more so as I grow older) but not always, that an agnostic would be the most correct description of my state of mind.” In Darwin’s posthumously published autobiography, he addressed his receding belief in orthodox Christianity. This chapter, initially excised by Darwin’s wife and son, was published in 1958 by Darwin’s daughter Nora Barlow. Judaism’s Oral Tradition that accompanies and explains the Biblical text, can accommodate the theory of evolution more comfortably than many Christian denominations. Jewish theology can draw on literature and opinions that allow for some nuance in the creation narrative, which, without commentary, is very cryptic. Seek out answers to perceived philosophical challenges to Jewish thought and observance. When anyone does anything that benefits you, your loved ones, your ancestors, or your outer social circle, no matter when it occurred, it is always appropriate to offer gratitude. The second half of the book of Exodus commences with parashat Terumah. Nachmanides suggests that while the first half of the Book describes the physical redemption of the Children of Israel from the subservience and shame of slavery in Egypt, the second half of the Book of Exodus identifies a means of spiritual redemption by creating the Tabernacle, a physical structure where Jews can encounter the Divine. The first vessel of the Tabernacle described in the Torah is the Holy Ark, also known as the “Ark of the Covenant,” a phrase made famous by the 1981 movie Raiders of the Lost Ark. The Torah states (Exodus 25:16) that the ark will contain “the testimony which I shall give you.” The Talmud (Bava Batra 14a-b) claims that a variety of historically important items were placed in the ark for safekeeping, including the broken Tablets of Law (which Moses broke upon witnessing the Golden Calf), the second complete set of Tablets of Law, and a Torah scroll written by Moses. Since the Tabernacle was built for travel and mobility, attachable carrying poles were designed for many of the vessels in order to allow for easy transportation. The Torah, in describing The Ark, the Table upon which the special loaves of bread were placed, the copper altar where animal sacrifice took place, and the golden incense altar, also included commands to create accompanying poles and rings to hold the poles to allow easy movement of the vessels. The Torah, however, contained an anomalous command regarding the rings and poles of the Holy Ark: “The poles shall be in the rings of the Ark; they shall not be taken from it” (Exodus 25:15). Why were the poles of the Holy Ark non-removable, and designed to be a permanent part of the ark? Some point out that the command to keep the poles permanently attached to the Ark was a practical one. Since the Ark remained sequestered in the Holy of Holies section of the Tabernacle, as such, it was not seen by anyone, save for the High Priest’s one annual encounter in the Holy of Holies on Yom Kippur. But, Rabbi Israel Meir Hakohen Kagan, known as the Chafetz Chaim, identified an important lesson that may be derived from the law of the poles of the Ark. The Ark is the most significant material representation of the Torah. It itself contained the Torah! Yet its support, that which carries it, is eternally connected to it. The message is that those who support the Torah are connected intrinsically to the Torah itself. People who enable Torah to be studied, and elevated are literally equal partners with those studying, teaching and immersing themselves in the Torah’s messages. Aside from having one of the most difficult names to spell, the state of Massachusetts is known for its rich history, serving as a main catalyst for the Revolutionary War, the founding of major universities, the colorful and stereotypical accents of its citizens, and its well-known sports teams which people either love or hate. Massachusetts in general, and the greater Boston area in particular, is also home to a long-standing, enduring, resilient and active Jewish community. In 1752, Aaron Lopez became the first Jewish citizen naturalized in Massachusetts in 1752. It was Lopez who founded the first Jewish community in Leicester, MA (west of Worcester) along with the family of Jacob Rodriguez Rivera. The two Sephardi families remained in Leicester until after the Revolution. The state’s first permanent Jewish community eventually settled in Boston in the late 1830s and was populated by central European immigrants. Congregation Ohabei Shalom, the state’s first synagogue, was established in the 1840s. After 1840, German and Eastern European peddlers, watchmakers, tailors, shoemakers and small business owners began moving to communities in central and Northern Massachusetts, especially to factory and mill towns including Pittsfield, Worcester, Holyoke, Springfield, Fall River, Lawrence, Lynn and Haverhill. The Sephardic community, dating from prior to the Revolution, endured in the southeastern port of New Bedford, through the 1850s, when Jewish German immigrants arrived. The first Jewish burial in Massachusetts occurred in New Bedford in 1857. Nationally renowned Jewish institutions such as Brandeis University (Waltham), the National Yiddish Book Center (Amherst), the New England Hassidic Center/the Bostoner Rebbe (Brookline) and Hebrew College (Newton) make their homes in Massachusetts. The Combined Jewish Philanthropies of Greater Boston serves as the Federation for the Boston area, while 12 other Jewish Federations serve other communities in Massachusetts. There are 45 Hillel Foundations in Massachusetts colleges (including at two Catholic colleges) and 10 JCCs, in addition to the Boston JCC Association. Countless Massachusetts Jews have served in local, state and Federal government and three Bay State Jews have been appointed to the U.S. Supreme Court: Louis Brandeis, Felix Frankfurter and Justice Steven Breyer, who currently serves. By 1917, 190,000 Jews lived in Massachusetts. The Jewish population grew to 263,000 in 1937, and as of 2017, was determined to be 293,080, 80% of whom live within an hour’s drive of greater Boston. On February 6, 1788, Massachusetts became the 6th state to ratify the United States Constitution. The Gregorian solar calendar used by the Western world, is based on the cycle of the sun. The tropical (solar) year is 365 days, 5 hours, 49 minutes and 16 seconds. Thus every four years an extra day is added to the year at the end of February in order to compensate for the loss of 5 3/4 hours each year. Consequently, the holiday of Passover must be observed in the Spring. To accomplish this, the month of Adar is doubled during a leap year (Adar I and Adar II). Why Adar? Before the Jewish calendar was fixed by mathematical calculation in 350 C.E. (approximately), the new month was determined by the Sanhedrin based on the testimony of witnesses who had seen the new moon. Likewise, the Sanhedrin declared the leap year based on their observations of the season. Adar, the last month before Nisan (the month of Passover) was the deadline for the declaration of a leap year. According to the current calendar, a Jewish leap year occurs seven times every 19 years. This year, 5779, is a leap year, and Adar I begins tonight after sundown. The Jewish people mark time through the Jewish calendar. Every Jewish person should possess a consciousness of Jewish time. Hadassah is not unique in its origin as a Zionist organization. What is extraordinary about Hadassah is that it developed into the largest women's service organization in the United States. By the 1990s, well over 300,000 Jewish women were registered members of Hadassah. Hadassah started small. In 1913-14 they sent two nurses to Palestine. By the 1920s, however, Hadassah had already established a nursing school and two hospitals (one in Tel Aviv and one in Haifa) and was rapidly expanding into youth services. When terror struck the Jews of Germany, Henrietta Szold and the women of Hadassah took charge of the Youth Aliyah movement, bringing hundreds of German Jewish children to Israel. During World War II, Hadassah’s activities continued to expand. The first Hadassah hospital in Jerusalem was opened on Mount Scopus, and Hadassah began two vocational training institutes. After the establishment of the State of Israel in 1948 (which Henrietta Szold, unfortunately, did not live to see, as she passed away in 1945), Hadassah launched a medical school and opened the Ein Kerem Medical Center in Jerusalem. By the beginning of the 1950s, Hadassah had transformed itself into a full range social service organization. Today, Hadassah is still a thriving organization. Through Hadassah, American Jews have enabled Israelis to increase their standard of living and medical care many-fold. Henrietta Szold died on the 29th of Shevat, 1945. This Treat was last posted on March 5, 2013. Do what you can to support and promote the State of Israel.